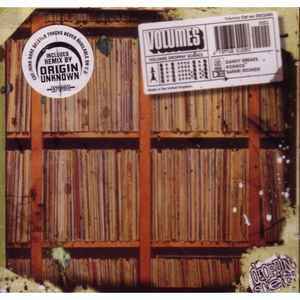 Tracks 1-10 are taken respectively from Volumes 1-10 on Droppin' Science. Volume01: Originally released as D.S.001A. Recorded in 1993. Volume03: Original mix released as D.S.003A in 1994, remixed in 1995 and released as D.S.003R with Droppin science logo etched into the B-side. Volume04: Originally released as D.S.004A. Recorded in 1994. Engineered @ Lucky Spin studios. Volume05: Originally released as D.S.005A. Recorded in 1995. Also featured a remix of "vol 2" by EZ Rollers on the B-side. Volume06: Originally released as D.S.006A. Recorded in 1995. Volume07: Originally released as D.S.007A. Recorded in 1995. Volume08: Incorrectly listed as "Astrologikal". Originally released as D.S.008A. Recorded in 1996 and featured a remix of "Step Off" by Undercover agent on the B-side. Volume09: Originally released as D.S.009B. Recorded in 1996. Volume10: Originally released as D.S.010A. Recorded in 1996.